Located in the heart of Santee, the Comfort Inn & Suites® in Santee offers easy access to Santee National Golf Club, Lake Marion Golf Club and Santee Cooper Country Club. 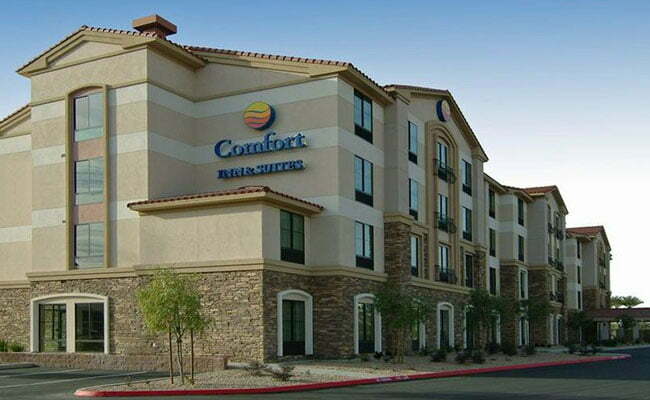 With convenient access to I-95, the Comfort Inn & Suites® in Santee is easily accessible from all the golf courses on our package. Guest rooms are well appointed with modern wood finishes, deluxe linens, and surround the guests in sootheing neutral tones. All guest rooms are non-smoking and offer a 40-inch flat-screen television, hair dyer, coffee maker, alarm clock, iron and ironing board. If you want to watch the big game with the ultimate in-room experience, upgrade to a suite and enjoy a maximum viewing experience with a 46-inch flat-screen television. Some rooms feature a desk, refrigerator, sofa sleeper and whirlpool. Guests of the Comfort Inn & Suites hotel are invited to relax in the seasonal outdoor pool or work out in the exercise room. Interior corridors offer safe and easy room access, while the business center offers access to copy and fax services. Your Morning Breakfast is full of hot and delicious options, making breakfast at the Comfort Inn & Suites the perfect way to start your day. Enjoy free hot breakfast featuring eggs, meat, yogurt, fresh fruit, cereal and more, including your choice of hot waffle flavors!